Comments: Born in 1906 Edward Dorrier was the son of Walter and Cornelia (Burgess) Dorrier. 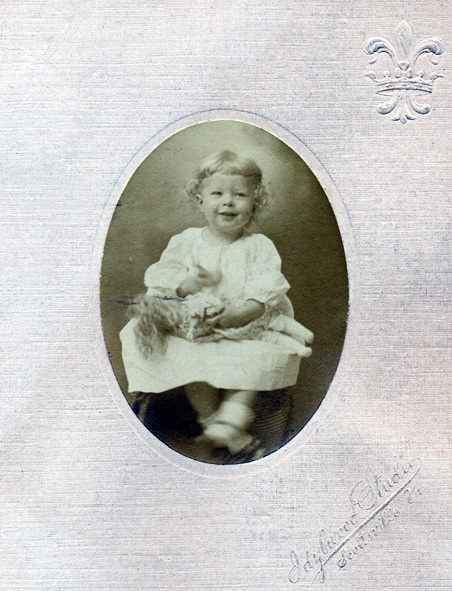 The above photo was taken at Idylwood Studio by William Burgess, his uncle, when Edward was 19 months old. 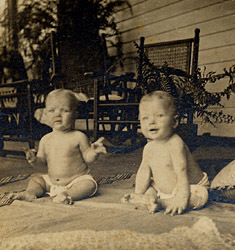 Because of the close proximity in their birthdates, Edward was a frequent playmate of his cousin, Katherine Elizabeth Pitts, pictured here in this 1907 stereoscopic card on Belle Haven's front porch. Edward Dorrier married Hazel Clevinger, a teacher at Scottsville High School, and they became the parents of a daughter, Irene Dorrier.